Your second—and admittedly woefully late—New Zealand nacho review comes courtesy of Boston University, who lovingly footed the bill for two types of nachos at O’Hagan’s, a dimly lit Irish bar on Auckland’s Viaduct. If you follow Nacho Patrol’s exploits, you probably know that free things almost always taste better: perhaps that why we can definitively affirm that decent nachos exist in countries ruled (ceremonial or not) by Queen Elizabeth II. Appearance: (7) served in a scathingly hot griddle, these nachos present what we’ve come to expect of non-US nachos. A selection of bright yellow chips melded perfectly with the redness of the chili, speckled with kidney beans, pale-green guacamole, sour cream, and a drizzling of what looked like thinly chopped chives or cilantro (but probably is something we can’t even begin to imagine). However, anyone who knows anything about mass-market cheese knows that melted provolone looks more like dead jellyfish and quite a bit less like delicious. Distribution: (6) If you recall our rant about the round chips at J.J. Foley’s, you already know about our Generalized Theory of Chip Nesting, and how it relates to the phenomenon of the Naked Chip. Disco on top, nudest colony on bottom. Similarly, we had sad lack of cheese–the few greasy, congealed strands we did find existed as a gloopy melange of flavorlessness, topped by too much sour cream (Nacho Patrol is all about making new words today). Nachos are about the cheese, folks! It doesn’t matter how good your toppings are if you don’t have a solid foundation! Quality of toppings: (6) As I mentioned, O’Hagen’s served us both beef chili nachos and a vegetarian option. To this date, we still have no idea what they put on the vegetarian nachos–with no obvious clues from the menu, we can only infer that it was some sort of warm-salsa-like medley, complete with a variety of veggies (was that green bean?). Our vegetarian cohorts enjoyed it quite thoroughly, though it’s meat sister had a somewhat strange, sweet flavor. Call us uncultured Americans, but we also were uncertain about the cheese–provolone has quite a strong flavor, much better left to sandwiches and not nachos. Give us cheddar any day of the week. Otherwise, good, mild guac and pleasantly salted chips. Price: (7) Though we didn’t pay anything for these beauties, we’ll review the menu price– NZD $14.50 (USD $9.50). By Boston standards, that’s actually not too outrageous. In fact, in the US that’s pretty much the going rate, which is why they get…an average score. Overall: 26/40. 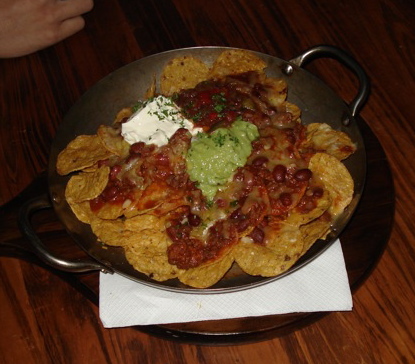 If you’re in Auckland and desperate for nachos, these probably will do it for you. Not great, but not horrible either, Mexican food in New Zealand seems to tread the middle road. Nacho Patrol will continue, however, to believe in that mecca of South Pacific Nacho Brilliance.